Dublin roots band I Draw Slow has been garnering praise around the globe since the release of their 2012 album Redhills. Now their latest release, White Wave Chapel (2014), is all the buzz at home and overseas with their unique sound, bringing together Irish tradition with modern Americana while staying rooted in the old-time style of Appalachia. Their impact abroad is redrawing the map for these Irish/Americana songwriters. They are happy to return Stateside this summer for a handful of shows in mid-July including Red Wing Roots Music Festival in Virginia, Tellus 360 in Lancaster, PA; Creative Alliance in Baltimore; World Cafe Live Upstairs in Philadelphia, and Grey Fox Bluegrass Festival in New York. 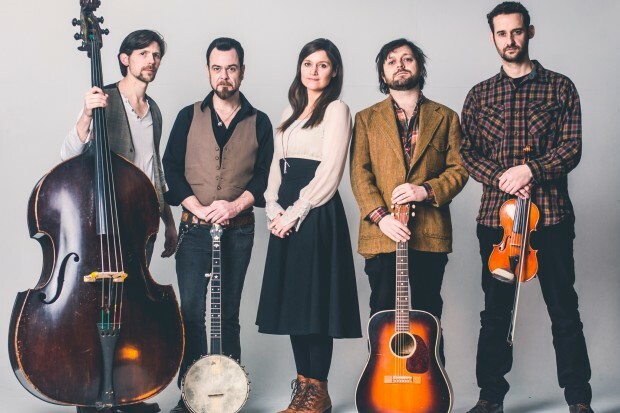 With the line-up of Adrian Hart on fiddle, Colin Derham on clawhammer banjo, Konrad Liddy on double bass, and siblings Dave Holden on guitar and vocals and Louise Holden on vocals, White Wave Chapel develops on the distinctive sound fans have come to love from I Draw Slow. It’s an arresting confection of old time Americana, bluegrass and Irish traditional music that swings from melancholia to joy and is always framed within well-crafted melodies and skilled performances. They offer a whole new songbook of stories with dark tales of debauchery and trouble swinging. White Wave Chapel, engineered and mastered by veteran Irish producer Brian Masterson (Planxty, The Chieftains, Van Morrison, Christy Moore, Norah Jones), has taken the band and their unique sound to an even wider audience. The album reached No 2. in the overall Irish iTunes chart, and was selected as RTE Radio 1’s Album of the Week. It has been described as “bewitching” (Irish Independent), “exquisite” (Sunday Times), “practically begs you to sing along” (Hot Press), and “a thing of beauty” (9/10). The UK press describes I Draw Slow as “American top league equivalents” destined “to blow the opposition away,” drawing favorable comparisons with Gillian Welch and Alison Krauss. They have played to audiences in the UK, Germany, Denmark, Belgium, performed with the legendary Béla Fleck and the Flecktones, and made an appearance at the Celtic Connections Festival in Glasgow, Scotland. The band is now in great demand in the US, touring there extensively over the last few years and have performed at several major US festivals including MerleFest, Grey Fox, Rockygrass, Pickathon, and the IBMA’s. Dublin, Ireland roots band I Draw Slow recently released their new album, White Wave Chapel.